In what seems to be an overture to the House, Gov. Greg Abbott added two new education-related issues to his special session call Thursday: school finance reform and increased benefits for retired teachers. The governor’s announcement came almost a week after Lt. Gov. Dan Patrick held an education-themed news conference to discuss school finance and teacher pay increases, a departure from his priorities during the regular session. Patrick proposed a plan, funded through the Texas Lottery, that would provide bonuses for long-term and retired teachers, add $200 million to the Teacher Retirement System, and give $150 million to struggling small, rural districts that lost money through an expired state aid program. Abbott’s additions of the new items appear to be a nod to the House, where his overall agenda is expected to face the most resistance. 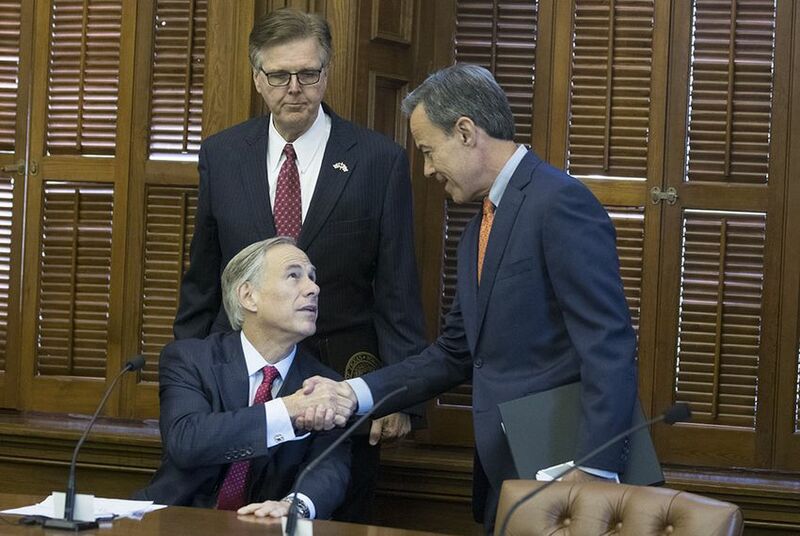 In a speech last month, House Speaker Joe Straus, R-San Antonio, said legislators did not need a commission to tell them how to fix the school finance system, because they have already studied the issue at length. Abbott has pushed back against that notion, questioning why legislators have not come to a consensus if they have examined the issue so thoroughly. But the inclusion of retired teacher benefits, school finance reform and a fix for the expired state aid program in the final call looks like an overture to such skeptics. State Rep. Dan Huberty, R-Houston, the House public education chairman, welcomed the additions to the special session call — and said that school finance reform was particularly important for legislators to address. "I look forward to working with my colleagues to address this critical need for our children and parents," Huberty said in a statement to the Tribune Thursday morning. "The House had made this a priority the last two sessions. I am glad the governor added this to the call as he recognizes we need school finance reform to accomplish property tax reform." Educator groups on Monday rallied in front of the Capitol against the governor's agenda, demanding that the Legislature put more state money into public schools and reform the school finance system. On Thursday morning, a number of House members took to Twitter to thank Abbott for listening to their chamber and adding their priorities to the call. Last month, state Rep. Drew Springer, R-Muenster, sent a letter to Abbott asking him to expand the call to include school finance for rural schools. The letter was also signed by state Reps. Ken King, R-Canadian; Dustin Burrows, R-Lubbock; Poncho Nevárez, D-Eagle Pass; and Ryan Guillen, D-Rio Grande City. Huberty filed a bill this week — mirroring one he filed during the regular session — that would inject state money into public schools and simplify the formulas for funding them. It would also help small, rural school districts depending on the expired state aid program. Several legislators in both chambers have filed bills to increase benefits for retired teachers.